Much of the content you read about setting up your website for success makes the assumption that you are using WordPress. About 19% of all self-hosted sites on the internet are run from the WordPress content management system (CMS). However, just because something works for a lot of people doesn’t mean that it works for everyone. Many small business owners in particular, have so many different things going on that the thought of having to learn WordPress doesn’t sound like much fun at all. Because of that, we’ve seen the rising popularity of solutions that are built to make website creation and management very simple and intuitive. We’ve actually got a few posts comparing some of these services – check out our posts comparing Wix vs Weebly, Weebly vs Squarespace, and Weebly vs WordPress for a more in depth comparison of the strengths and weaknesses of each. Today we’re going to give you a list of the best WordPress alternatives for business, with the focus on platforms that are easy to setup and maintain for the average, non-techie person. If you’ve already chosen a platform, we actually have guides for Seo on Squarespace as well as for Weebly. First, I’m not necessarily picking a “winner” here. You’ll find that many of these solutions specialize in different things. 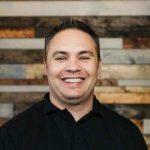 Some are simple website builders and no more, while others like Hubspot are more of a business solution that happens to include website management. Second, whether or not you sell products online makes a big difference in the website tool you choose. Some tools like Shopify and Bigcommerce are built with online stores in mind, and others have a more limited feature set when it comes to managing the sale of physical products on your own website. Third, this isn’t intended to be a full review of each service. I’m merely bringing you some of the best WordPress alternatives and hitting the highlights on why I think they are worth exploring further. In the spirit of full disclosure, I’ve been a Weebly customer for several years. At this point I also have many sites built on WordPress, but still maintain sites for myself and for businesses I’ve helped on Weebly. My goal is to give a list of viable alternatives to wordpress, not to sell you on any one service. 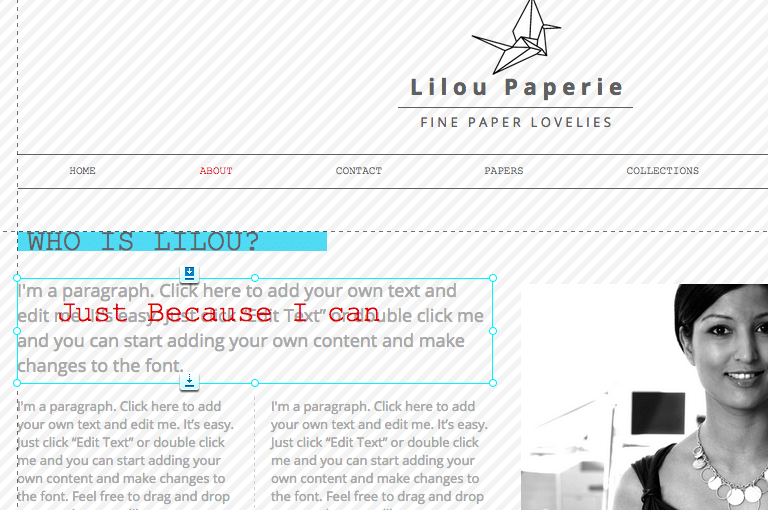 That said, when friends who’ve never done a website before ask me what to use – I tell them Weebly without hesitation. 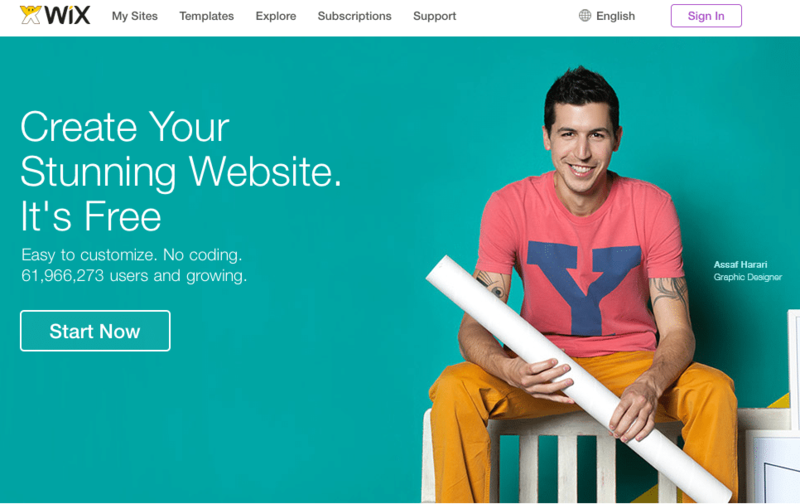 With Weebly, you start by picking a theme design for your website from dozens of pre-made templates. This is one area where they’ve come a long way since I started with them. The most common request in the early days on their blog seemed to be people asking for more theme options, and I’d say that Weebly delivered in a big way. You’ve got a number of sleek, modern themes to choose from – all of which are mobile-friendly automatically. This simply means that when somebody comes to your website from their phone, your site will adapt and look like it was made for that small screen. 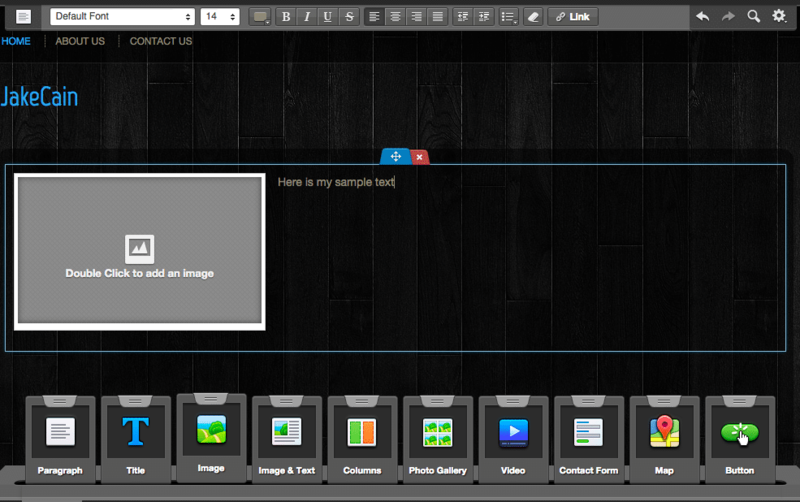 The Weebly site builder that you are taken to is a “drag and drop” interface. So you click on an element that you want, like an image or text block and drag it over to where you want it on your website, and then enter the text or upload the image. There are a number of different functions like inserting multiple columns, custom HTML, etc. that all follow this pattern. The tagline Weebly uses to describe their site builder is “Surprisingly Easy” and I really think that’s a fair assessment. It is about as straightforward as it comes and you could have a small, very professional, self-made website ready to go within a couple of hours. 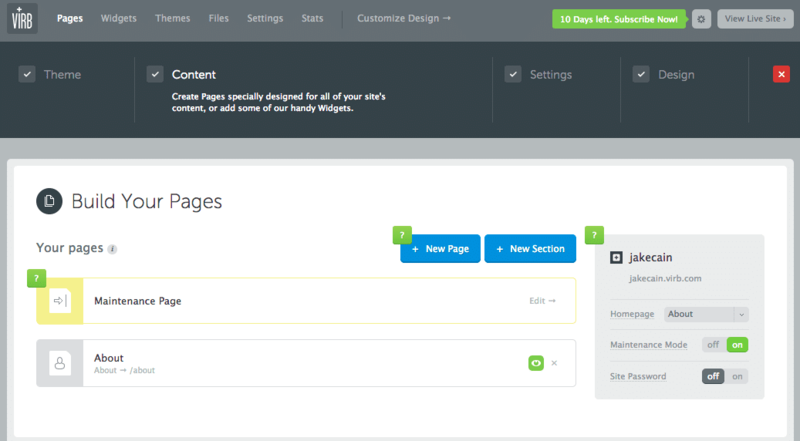 Weebly has also added quite a bit of behind-the-scenes customization that can help with SEO. Read more about SEO on Weebly here. 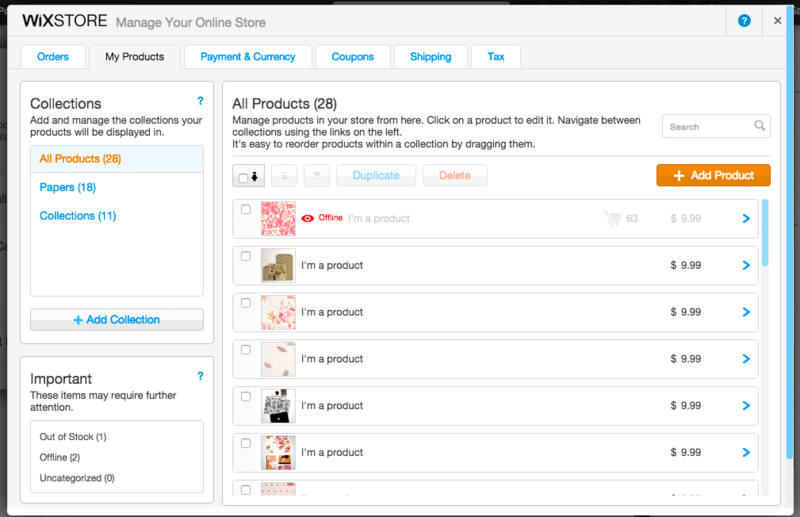 If your business is selling products (physical or digital) online, Weebly also has a built in shopping cart and store management functionality. They are integrated with several different payment solutions including Square, Paypal, Stripe, and Authorize.net – so adding products and getting people to pay you is also a pretty simple process. As mentioned earlier, you can start with a free account and see what you think about the website builder and the ecommerce features (if you plan to use them.) You can always upgrade later to the appropriate account for your business and keep building your site. The main difference between Pro and Business is the more robust ecommerce features. If you are a true ecommerce store, you’ll want the Business plan because it has an unlimited number of products, coupon codes, and more. However, if your business is a service company, let’s say an HVAC company – then Pro would be all that you need. In both cases, the price you see includes hosting. This is true of many WordPress alternatives, which really simplifies things for you because outside of your domain name purchase, everything you need is in one spot. Wow, it doesn’t get much easier than Wix. If you like things simple, you should really check it out. They have hundreds of templates to choose from, and most of them are very sharp and modern looking. Once you view a template and start building, they’ll ask you to create an account, but it is free to build. Eventually, you’ll want to upgrade to a paid account so you can use your own domain name and the other features that come with it (more on that later). Besides the built-in elements of a typical website, Wix also has an App Market where you can get even more add-ons for you site like customer review modules, event calendars, and a lot more. Some are free and some are things you pay for, but often have a free trial. One feature in particular that I love about Wix is shown above, the ability to change the entire color palette with just one click. All the tools on this list will let you change the color of just about anything that you want, but often you are changing one thing at a time. Since color coordination isn’t my strong suit, I like being able to pick from some sets of color that already look great together and change the entire site at once. 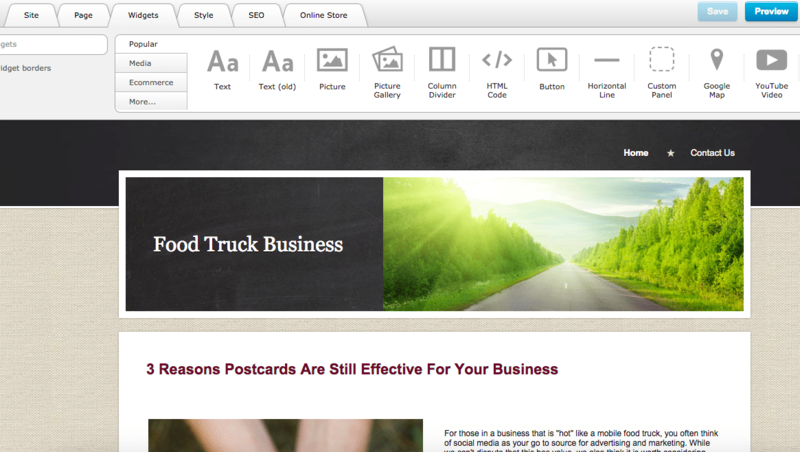 Another thing that separates Wix’s site builder from many others is that you can really put anything just about anywhere. Once you’ve added an element like a Youtube video or a block of text, you can then click and drag it to exactly where you want it. Obviously you’d never do something quite like that, but there may be times when it makes sense to overlap or layer things on your site. 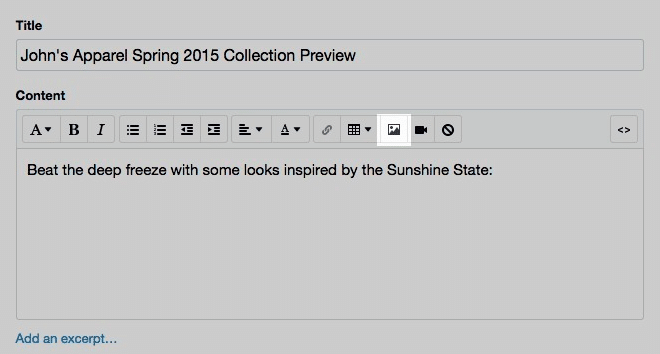 In most drag and drop editors, this isn’t possible. I’d have to drop that headline below my paragraph or above it, no matter what. So the Wix editor gives you a lot of freedom. But what about Wix and SEO? Wix has a well built-out ecommerce solution that is available in their upper tier subscription packages. You can add all of your products into their Wixstore and then add product galleries and collections of products on your site. From the payment side, they let you choose from a list of 7 different payment vendors including Paypal so people can purchase your products online. Notice that these prices are if you pay for the year in advance, as opposed to going month to month. You can cancel for a full refund if you do so within 14 days of purchase. However, since you can build things out for free – you should really have a good idea whether or not Wix is for you before you actually purchase anything. They do include an optional free domain registration with most of their packages, which helps sweeten the deal a bit. However, you can also bring a domain purchased elsewhere over to Wix. Click here to try out Wix. Squarespace has made a splash in recent years as another great alternative to WordPress and more traditional content management systems. There are many similarities to the feature set I mentioned with Weebly above, so I’ll hit the highlights. I heard from many small business owners in the research phase of this post and didn’t hear one bad thing about Squarespace. When you first sign-up, you start by choosing a template or theme that defines the look of your website. They are sorted by category, and at the time of this writing there are 13 different themes in the “business” category. Each one has a very modern look and is mobile friendly out of the box. You can start very quickly with a free trial, and then begin by answering a few different questions like the purpose of your site and information about your business (shown to the left). After that, you are taken to their main site builder which has all your options to the left, including the ability to go directly into pages and start creating and editing based on your starter template. If you’re building a site and plan to follow the placement of text and images of the template, you’ll find that updates are very simple to do. If you want to add in more images and different features, there are some drag and drop elements – but in my opinion it takes a little bit of getting used to in order to get things just the way you want them. The flip side of that is that you have customization options on just about everything if you really want to dig in. The good news is, there are plenty of written and video tutorials available if you need them. Click here to view our own tutorial on Squarespace SEO. 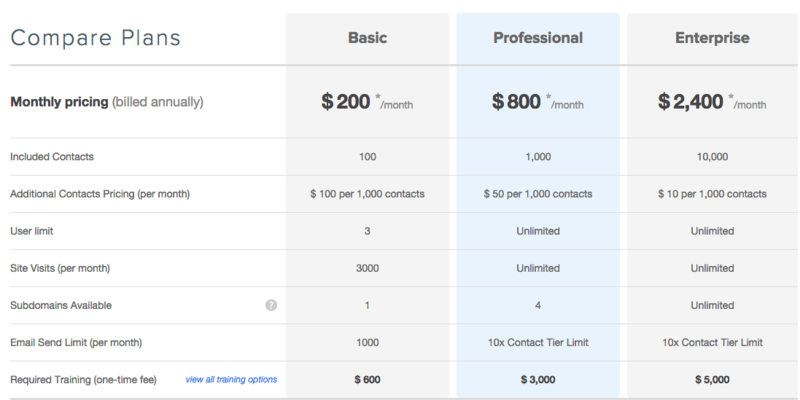 Squarespace has 3 different tiers of pricing, but lets you start with a 14 day free trial. The most expensive plan is $24 per month, which is geared for those in ecommerce – selling a bunch of products online. Each package includes a “free” domain name for a year, which is a nice feature. After that, it renews at $20 per year – which isn’t unreasonable. For comparison sake, you’d pay about $15 per year at a place like 1and1 or GoDaddy. If you aren’t an ecommerce business that is selling products online with needs for a shopping cart, etc. then the $16 per month option is probably the best for you. While Squarespace and Weebly were more universal business solutions – meaning whether or not you actually sell goods online, Shopify is built with online ecommerce retailers in mind. 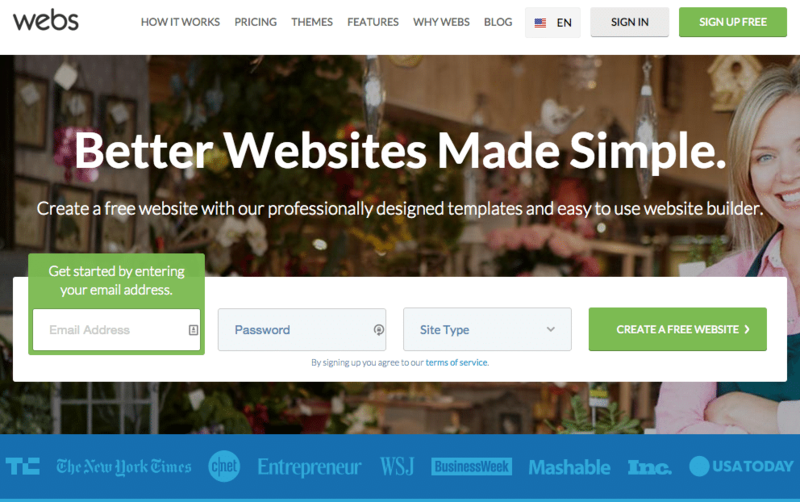 Maybe it’s better said that Weebly and Squarespace are website builders that also have ecommerce and Shopify is an ecommerce solution that also has a website builder. Because of that, they offer more features like a POS system to manage you in-person sales, along with TONS of options for accepting payments in your online sales platform. You do have full control over your site’s design, so colors, logos, etc. can all be switched out easily. Shopify can also connect you with professional designers if you are looking for something beyond what you can do with templates. Obviously you can also find and hire your own designer for a Shopify site if you’d like to do that. Shopify also has their own version of an “App Store” which really lets you customize your site and the features quite a bit. If you’re familiar with WordPress, it is a similar concept to “plug-ins.” The Shopify apps include different options for coupons, integrating social media, setting up your SEO, and a lot more. Shopify offers a 14 day free trial on all their plans. They also include an unlimited number of products and a free POS card reader if you want to use Shopify to take payments in your retail location. Many places could get by on the basic plan, but stepping up to professional gives you access to gift cards and better reporting. The credit card rate also comes down the higher your package level, so if you are doing high volume then stepping up to a more expensive solution may pay for itself. Hubspot may not jump to mind when thinking about the best WordPress alternative, but it’s definitely a solution worth considering if you’re ready to take your business to another level. 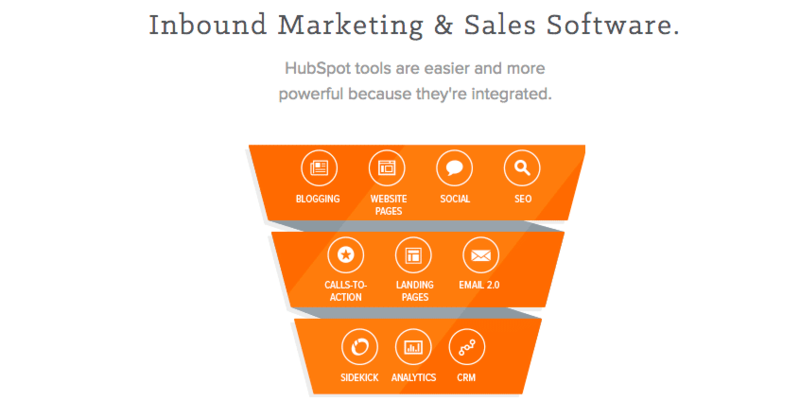 Hubspot is much more than a “CMS” or website builder. It’s really focused on sales and marketing intelligence and automation, and building your website is just one part of that. It also comes with CRM, very detailed analytics, SEO, and even email campaigns. If you are currently on WordPress and dissatisfied with it, check out this helpful comparison of Hubspot and WordPress. Relative to everything else we’re including as a viable alternative to wordpress, Hubspot is expensive. 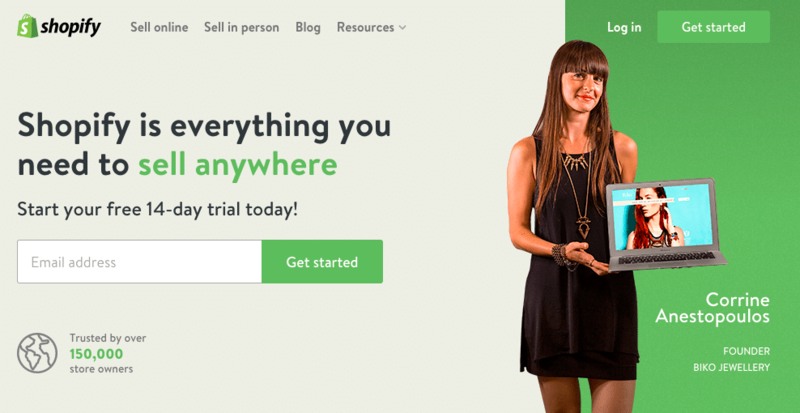 However, it’s really not fair to compare something like Hubspot to Squarespace. If you do nothing else, the Hubspot blog is a great read for any business owner and you should check it out. 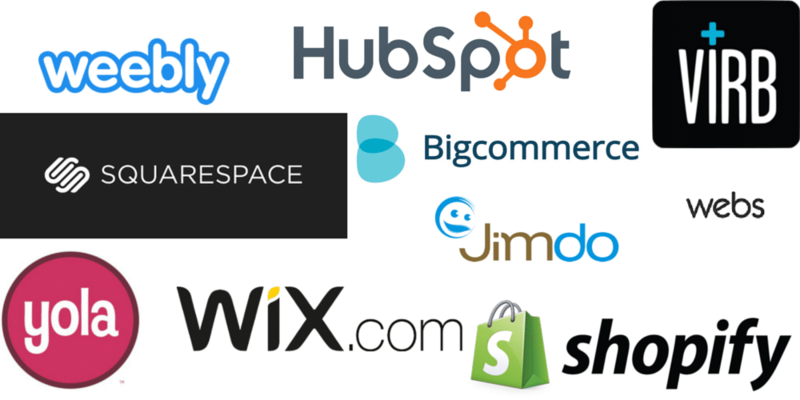 Of the website builders we’ve talked about, Bigcommerce is most closely related to Shopify. It is a website solution, but their big focus is on building stores online. If you aren’t selling products on your website (and don’t plan to) they Bigcommerce isn’t your best option – I’d go with something like Weebly or Wix. However, for those in the ecommerce space, Bigcommerce has a ton to offer. It comes with a built-in shopping cart and payment gateway, plus plenty of other tools for marketing, SEO, and reporting. They also integrate with over 65 payment services like Paypal and others. 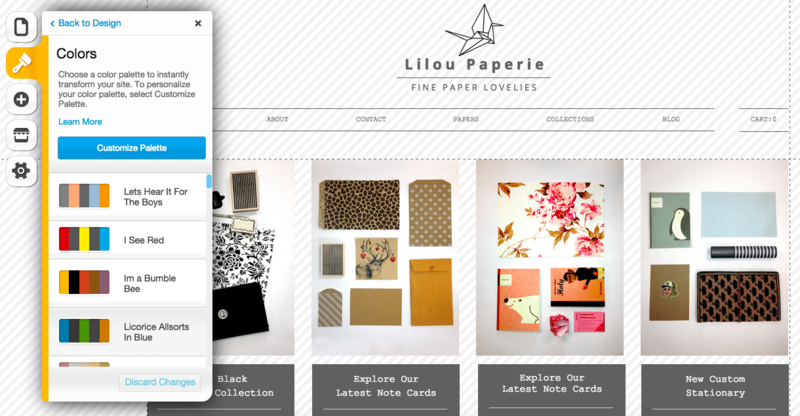 You can start any Bigcommerce package with a 2 week free trial to see if you like it. The biggest difference in the lowest tier, silver package, is that you give up a 1.5% transaction fee on sales. So if you’re doing higher volume, you’ll at least want to go with gold. Gold and Platinum also come with unlimited storage and an “abandoned cart saver” which helps make the process of coming back to buy something that you didn’t complete purchasing in your first visit. 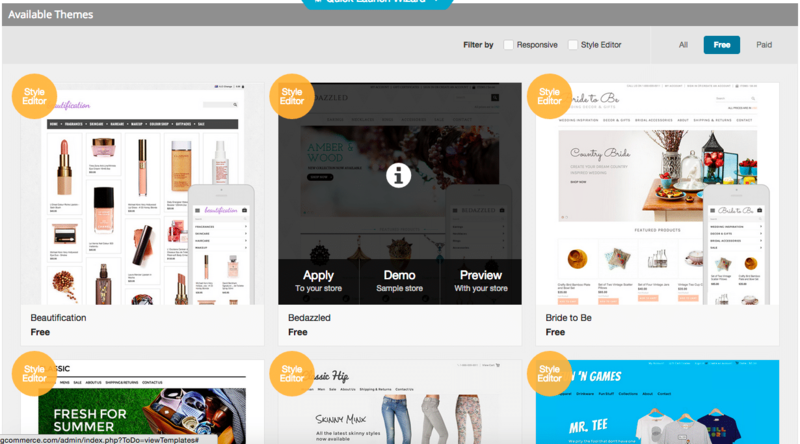 Click here to see more of Bigcommerce’s features. It seems like more and more website builders focused on ease of use keep popping up. We’ve given some information on some of your premiere options already, some of which come at a premium price tag. Jimdo has a free package available, so you can dive right in and start building. They also offer a $240 per year business package, which includes 2 domain names and lets you add as many products as you’d like with a Paypal integrated shopping cart. If you aren’t selling online, the $90 per year package would probably be sufficient for you as it also includes one domain name. 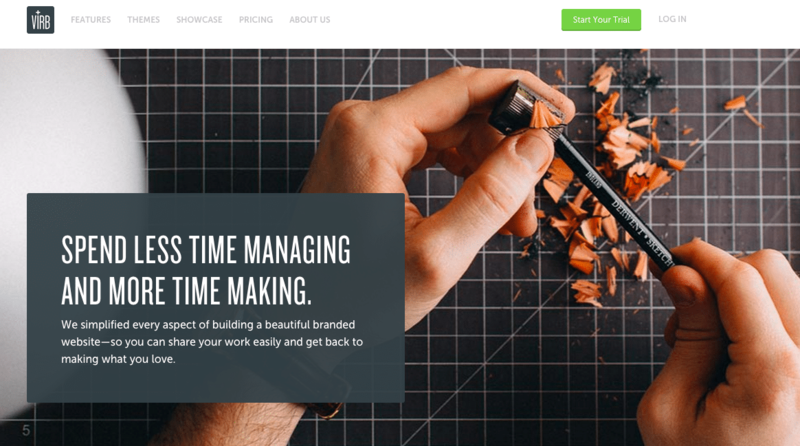 Virb is another online website builder that is focused on simplicity. They have only one tier in pricing, which is $10 per month. 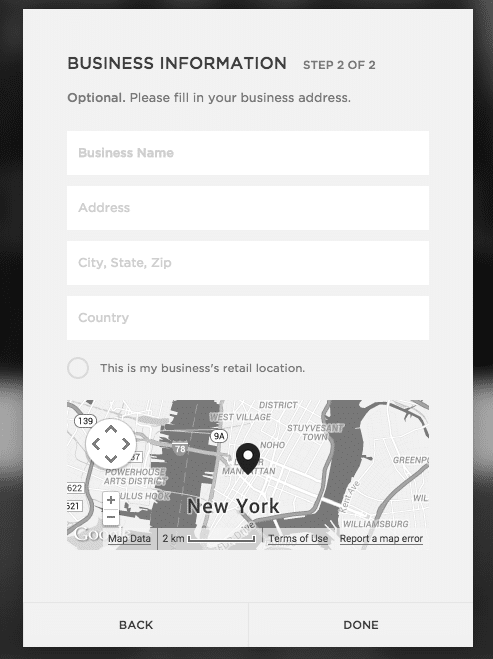 This doesn’t include a domain name, but you have the ability to buy a domain elsewhere and connect it to your Virb account. This also includes connection with an Etsy or Big Cartel store for your product pages. Virb isn’t necessarily as feature-rich as some of the other alternatives we’ve discussed, but it’s very affordable and has a lot of nice looking, mobile-friendly themes to start with. Webs.com (not to be confused with Web.com, which you’ve probably seen on TV) is a drag and drop website builder that can be used for personal sites or for business. The business package runs for about $23 per month, and it includes the ability to do ecommerce using Paypal or Stripe to accept payments. Webs.com also advertises that they’ll give you a “free” domain name at this price, so you won’t have to worry about registering separately. 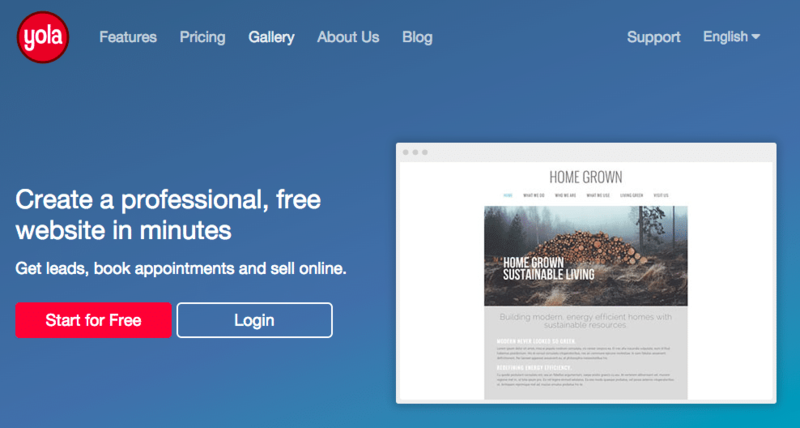 As is typical in this type of website builder, you can start building for free and upgrade later. They have dozens of templates to choose from, but in my humble opinion they don’t look quite as modern as Squarespace, Weebly, or Wix. It is pretty simple to use, as you just drag whatever kind of content you want up into the page area above. You can get rolling pretty quickly without any special design skills. 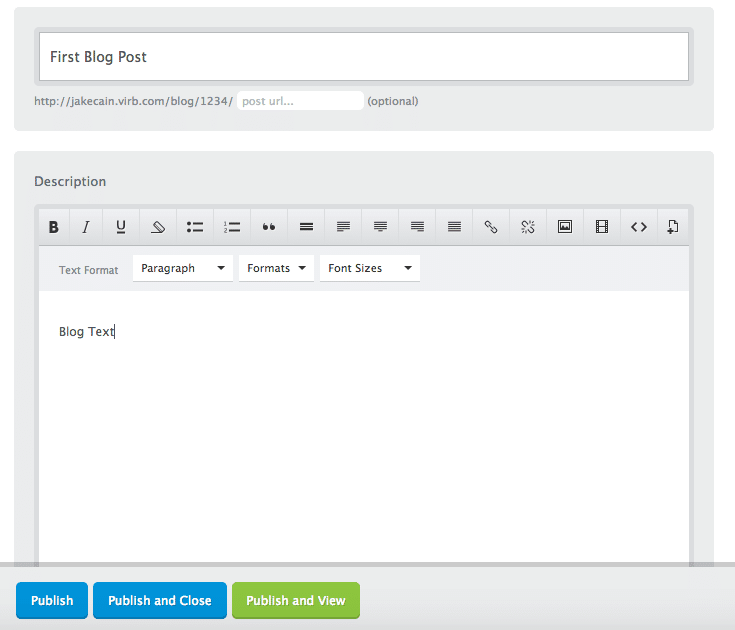 The final entry on our list of viable WordPress alternative is Yola. 1. Yola includes a bank of 3,000 professional stock photos with a silver or gold plan. 2. Yola gives the option to start with a custom design at $499, which includes their silver package for 1 year. In the Yola builder, you can pull different “widgets” from the top list and drop them into your site template below, and then edit from there. As you can see, picking the right website solution really depends on your needs and preferences. I think all 10 of these alternatives have their place, but some are better than others depending on your budget, your business model, and how picky you are about the design of your site. Once you’ve made a selection, the next step is to learn how to rank in Google and get more free traffic to your site. Our software can help you do just that by finding the right keywords to target with your blog content. 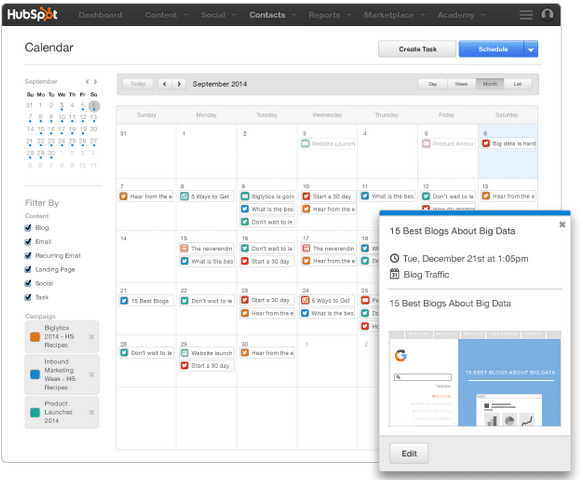 If you’re ready to try it out with a FREE 7 day trial at Long Tail Pro. I knew of most of these platforms but the last 4 were all new to me. Great article. Nevertheless, I prefer WordPress =D. Thanks for this wrap up! Hey Hector – I’m a WordPress fan myself. Some of these sites like Wix have a remarkable amount of customers, so there is certainly a market for these kind of site builders. I appreciate you reading. Are you sure these are WP alternatives? Drupal, Joomla, Concrete5, Perch, these are more like WP alternatives. And don’t you just love SaaS! I was approaching it from the perspective of alternatives for building/managing your website that some might find more user-friendly. Fair point though… I basically started by reaching out to small businesses who didn’t like using WordPress to manage their site and asked what they were using. Great article Jake. This is really an awesome list. Though we all know, how popular and effective WordPress is and in near future none can be replacement of WordPress but I personally think Weebly might be somewhere close to that. However, as you said, “first, I’m not necessarily picking a winner”, so I agree these are few alternatives which are worth exploring. I agree – WordPress has a lot going for it and is so widely used for a reason. However, I’ve met a lot of people who find it a little overwhelming and prefer something simpler that they don’t have to spend time learning. I appreciate you reading and your comment! Awesome article! Already i familiar with webs, Weebly and Hubspot rest unknown for me, i think premium version suitable for me, Maximum free version forced add their ads. Thank you, Al. Yes, as stated I’m a big Weebly fan and still use it for some of my sites. When people who’ve never done a website before ask me what to use, I always recommend Weebly because I think it’s easy and I’ve always found their support helpful. Awesome article! Already i familiar with webs, Weebly and Hubspot rest unknown for me, i think premium version is suitable for me, Maximum free version forced to add their ads. Nice article Jake. 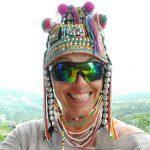 I have started w weebly, Really its good and easy to use my weebly blog is here . I found weebly very useful , i started a site with weebly yesterday after reading this. Sitelooks amazing, I’m using weebly site for my gaming clan.. Everybody think wordpress is the only best platform to start a blog, Thank you jake for sharing wordpress alternatives. Hey there – glad you liked it! I’m a big Weebly fan too – very easy to get up and running. Thank you for a further wonderful article.. IBC Spain | IBC Business Consulting – Spain | IBC Law Firm – Spain | IBC Marketing & Advertising – Spain | IBC Web Solutions – Spain | IBC Transport & Logistics – Spain | IBC Business Club – Spain | IBC Hotels – Spain | IBC Restaurants – Spain | IBC Clubs & Bars – Spain | IBC eStores – Spain | IBC Entertainment – Spain | IBC Film – Spain | IBC Music – Spain | IBC Fashion – Spain | IBC Sports – Spain | IBC Art & Exhibition – Spain | IBC Classified Ads – Spain | IBC Car Trade – Spain | IBC Real Estate – Spain | IBC Jobs – Spain Where in addition might anyone obtain that types of info in this particular fantastic technique of writing? I own a powerpoint presentation following few days, using this program . with the look for such information. Awesome, post Jake. I really like and know about the WordPress and Weebly. But Weebly can defeat WordPress because many user’s are love to . After reading your post I get some of the new platforms. That’s a great list of WordPress alternatives Jake. I knew many of them already but today got to know about some new ones. 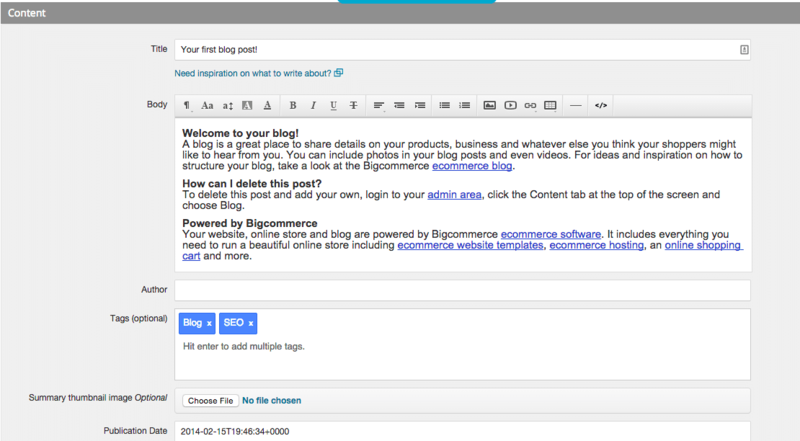 There might be many alternatives but still WordPress seems to be the best among all, at least for me. Thank you for sharing this and letting me know about some ones. Wow, a detailed post from you guys again, never disappoint! I knew of a few of these but not all of them. It’ll help with the consideration of Web 2.0’s, or a great way to start a new site and see what it can do. Definitely some food for thought! Thanks for sharing! Great Stuff Jake. For long run and authority site WordPress, Got a huge community support. I personally think wix is great alternative of WordPress. Its more like easy drag and drop as compared to other website and you will have fun while making your website. Its like more for personal website then blog. Thank You for sharing list will consider few other also. I love these web2.0 site, I use Weebly for alternative blog now. Thanks for sharing! Really, these team doing a great job. I really enjoy this one and I will use these alternative platforms for web2.0. I personally think wix is great alternative of WordPress. Its more like easy drag and drop as compared to other website and you will have fun while making your website. I knew of most of these platforms. I hate wix but if you need a fast site it’s a good solution. it’s an informative post. I read some articles on this site and I think your blog is really interesting and has great information. Thank you for your sharing. Wix and Weebly, both are the good alternatives for beginners.